We are so pleased to announce that many Hopis will be participating in our first annual Fair. The Foundation is providing monetary and logistical support to initiate what we hope will on-going participation of Hopi peoples at our Verde Valley Archaeology Center. We invite you to come to this free event, mingle, learn and welcome our Hopi friends. — Ramson Lomatewama, a Hopi poet and artist who participates in Hopi traditional culture, is an eloquent speaker on Hopi culture in relation to today’s world and member of the Museum of Northern Arizona board. He is a traditional-style katsina doll carver and jewelery maker who has developed a unique contemporary hot glass art based on ancestral images. –Yellow Fox dance group from Moencopi, 3 generations, all active participants in Hopi traditional life, will share the Butterfly Maiden dance with you at 11, 1 and 3 each day. This is the first time they have done this traditional social dance off of Hopi land. The father and son are traditional carvers and will share that at their table. –Demonstrations: We also welcome Dorlene Gashwesemoma, traditional basket weaver: Valencia Anton and JR Mahle sculptural and contemporary carvers. I thank Mary Boles for helping me spread the word at Hopi inviting artists to come and have a table at the Native American art show. We anticipate a good representation of Hopi art and great chances to meet these warm-hearted people. 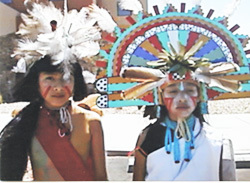 –Help shuttle Hopi people to the V Bar V Heritage Days event held this same weekend for their enjoyment and education. V Bar V is the largest known rock art site in the Verde Valley. Please coordinate with Sandra if you plan to help out. Thank you so much! Natwani means “produce” or “vegetables,” but more significantly, it refers to the processes and rituals necessary for the rejuvenation of all life. It is the intact web of obligation and activity involved in the planting, harvesting, processing, hunting and gathering of food. It is physical and spiritual sustenance. Come learn more about the work of this dedicated group of traditional farmers and view a film they made about Hopi agriculture twice daily at the Fair and enjoy talking with them at their table. Please learn about Natwani here and Like them on Facebook. At the Hopi Head Start office this past week, Lynette Shupla, coordinator, spoke in glowing terms of how much the children enjoyed receiving new coats and clothing and learning games. All 195 children in the program in 4 villages received something, with the most in need receiving the 50 coats and sweatsuits. We hope to extend this next year and also begin earlier in the fall. The faces of the kids really convey the message more than any words. Photos by Jolene Johns, special needs coordinator. Year round we take supplies for ceremonies and try to provide some materials for needed home repairs. Many people at Hopi have badly leaking roofs, need materials to make traditional structures such as bread ovens or piki houses and more. These devout people continue a lifeway that is of importance in the world. But in today’s tiime it does take monetary inputs to maintain their homes.